A romantic comedy set amidst a colourful Italian family in New York, Moonstruck embraces the magic of love while poking playful fun at men, women, and the undefinable ties that bind them. Thirty-something widow Loretta Castorini (Cher) lives with her parents Cosmo and Rose (Vincent Gardenia and Olympia Dukakis) and Cosmo's eccentric dog-loving dad (Feodor Chaliapin, Jr.) in a multi-level New York apartment. To get on with her life, Loretta agrees to marry the well-meaning but boring Johnny Cammareri (Danny Aiello), although they don't really love each other. Meanwhile, Cosmo is carrying on an affair and ignoring Rose. 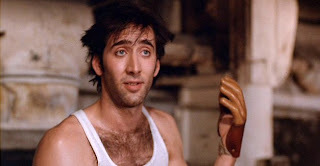 When Johnny travels to Palermo to visit his dying mother, Loretta meets Johnny's estranged brother Ronny (Nicolas Cage). The two brothers have not talked to each other for five years: the deeply passionate Ronny blames Johnny for an industrial accident that left his hand mangled and resulted in his fiancée leaving him. With an unusually large moon hovering over New York, there is an immediate attraction between Loretta and Ronny, they sleep together, and go on a grand date to the opera at the Lincoln Centre. With Johnny on his way back from Italy, Cosmo still cheating on Rose, and Rose enjoying the attentions of university professor Perry (John Mahoney), the family's loves and tribulations come to a head over the breakfast table. Moonstruck exists in a pleasant dreamy state, where the pull of the moon means everything is possible, fundamental questions can be asked, and fate stands at a multi-pronged fork. The love adventures of the Castorini family float in on a bewitching mist as real as an exaggerated moon that seems to last for days. The parallels between Loretta and her parents is a big part of the movie's charm. 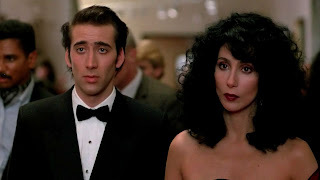 Moonstruck is not just about Loretta; it is also about Rose and Cosmo, the rich, Academy Award winning John Patrick Shanley script more interested in the eternal themes of romance that span generations. In as much as Loretta is a widow, Rose may as well be, with Cosmo taking her for granted and engaged in a full-fledged romance with his mistress. Rose finds a potential new relationship with Perry just as Loretta is discovering passion with Ronny. And while Loretta needs to find the courage to break the news to Johnny that she is now in love with his brother, Rose has to find the courage to draw the line for Cosmo. And Rose gets to ask all the difficult questions, wanting to understand why Cosmo would stray, why Perry could possibly be interested in her, and why both Johnny and Ronny are lusting after her daughter. Rose: Why do men chase women? Johnny: Well, there's a Bible story... God... God took a rib from Adam and made Eve. Now maybe men chase women to get the rib back. When God took the rib, he left a big hole there, where there used to be something. And the women have that. Now maybe, just maybe, a man isn't complete as a man without a woman. Rose: [frustrated] But why would a man need more than one woman? Johnny: I don't know. Maybe because he fears death. Rose: That's it! That's the reason! Rose: No! That's it! Thank you! Thank you for answering my question! Love and life become intertwined, re-enforcing and justifying each other within each generation. Loretta comes to life upon meeting Ronny and rewards herself with a youthful make-over, just as Cosmo believes he is prolonging his youth by keeping his seductive skills sharp, while Rose receives a sudden reinvigorating jolt thanks to Perry's interest. The central performances are sympathetic without succumbing to excessive emotional overload, director Norman Jewison finding the balance where hearts can flutter without theatrical melodramatics, despite the vigorously pumping Italian blood. Cher has the longest character arc, from willing to settle for the stability of boredom to happily embarking on a journey of passion. Cher won the Best Actress Academy Award by giving Loretta realistic residence between grounded and fanciful, realizing that time is ticking and opportunities for risks are fading. 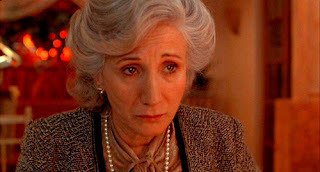 Olympia Dukakis was also triumphant at the Academy Awards for Best Supporting Actress, as she provides Rose with plenty of dignity but only a slowly emerging strength to reclaim her husband's attention. Nicolas Cage and Vincent Gardenia are colourful but a bit more predictable, Cage filling Ronny with pent-up rage and combustible, opera-loving sensitivity, Gardenia in comparison quiet in his abdication of a meaningful family role, more interested in leading a discrete life of betrayal. Men and women will forever struggle to define their relationships, but a large, low moon over Manhatten certainly helps to pull confused hormones in the right directions.